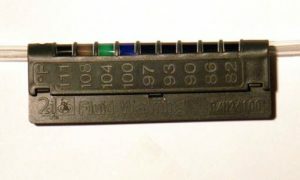 A snap-on gauge was developed to monitor the temperature of fluids as they are dispensed into the human body. The gauge was designed to attach to tubing so the fluid temperature could be monitored as it entered the body. 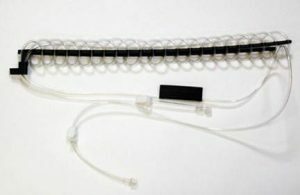 The liquid crystal strip was held against the tubing using a plastic housing that clamped around the tube. The rigidity and memory of the polyester substrate used on the LC strip was causing the clamp to spring open and thus fall off the tube. To overcome this, aluminum was laminated to the back to the strip. This allowed the strip to hold its form around the tube and did not cause temperature loss in doing so.